Hello Everyone! I hope you're enjoying your last few weeks of summer. I am transitioning into "oh yeah, school is starting" mode as we speak. I decided to share an activity I do with the song "Mrs. Macaroni" that is really appropriate and fun for the beginning of the year (I suggest grades 2 and 3). 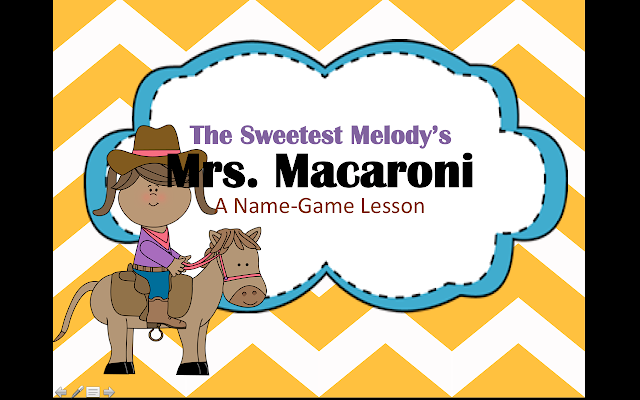 To begin, I play the tune of the song on the piano and invite students to learn as many names as they can (walking around talking) while I play. At the end of the song, I have them "log" the names into their brains (its so cute to see them looking around at each other, trying to remember). We repeat this about two more times. Then, I show them the lyrics slide and sing the song for them. Secondly, I have them "sing" without making sound as I sing (lips moving). Lastly, they sing the song without me but with the help of the piano (by then they've heard the tune at least five times). I congratulate them on already being independent singers from day one! Next, I show them the real music. This is such a teaching point. We discuss things we learned in prior years (most can chant the rhythm, many can identify specific patterns and pitches). We discuss that there are still more things to learn (this is a real "hey, you're still responsible for this information" kind of moment and can help you judge who retained what without taking too much time). I then show them how we will substitute "Susie" for other names in the class (C - C - C for Carlos). Students love volunteering or I even bring in famous names (D - D - D for Darth Vader). 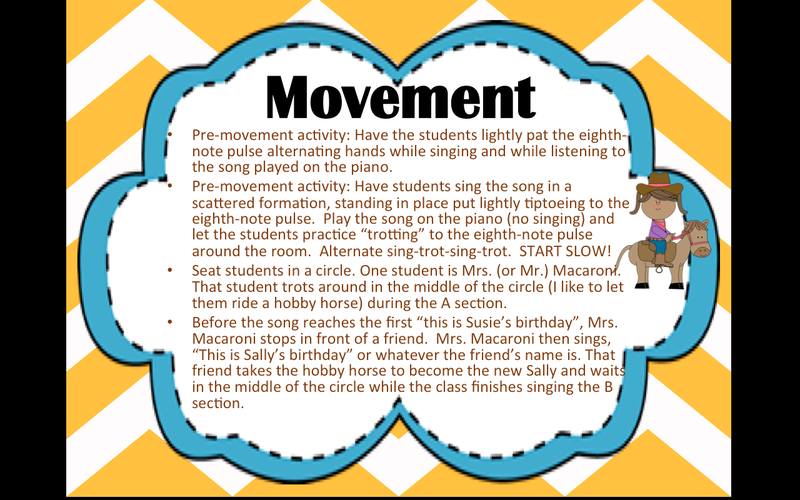 Once this is established, I complete the movement activity listed here (it is very sequential and works well - you get the kids up and moving on the first day, interacting and having fun, but it is controlled and purposeful). And I love looking totally silly riding around on the hobby horse, sometimes I even throw on a cowboy hat, haha. Note: be very very careful with tempo - it is fun to speed up the song and see them try to trot along - but don't go too fast at first or its just a mess! Last (or on a subsequent lesson), I add the instrumentation. Note: Pitches with a " (For example, C") are the higher pitch on the instrument. I hope this helps your back-to-school plans! Enjoy! Hey there readers! I can't wait to start blogging again. I took a (major) break while my husband battled cancer (lymphoma - he's in remission) and I had our first child, a precious baby girl. I will be sifting through comments but sadly, two things have occurred that will effect most of the comments: 1) My main laptop that stored most of what I created crashed - I had though I had backed up everything but some things were left out - ughhh and 2) I have my 7 Habits stuff up to share ideas but I am not allowed to distribute the materials in any way. That being said, this post will include some ideas for teaching students Orff orchestrations from the volumes (especially with using visuals). Note 1: My partner and I have a great set-up at our school - we have more than enough Orff instruments so each child is on an instrument at a time. If your students have to share, you may find things a little more difficult but still do-able. With more difficult Orff pieces we will also combine to teach or save it for our after-school ensemble. Note 2: All of these visuals were created in PowerPoint - it is seriously easy. For staff notation I used noteflight.com (free and user-friendly). When selecting a piece - always ask yourself why? What is it for? A performance? To teach 3/4? To incorporate movement? Having a purpose for the piece is can help you decide what you want your students to learn from it and sharing that purpose with them is also a great idea. Here's a piece we used at the beginning of the year with 4th and 5th grade. Both grades play lots of things from the volumes throughout the year and the 5th graders will use music from the volumes in their play (we do an adaptation of Shakespeare plays with 5th grade and the students provide the music and sound effects - its very "movie-score" and very cool). 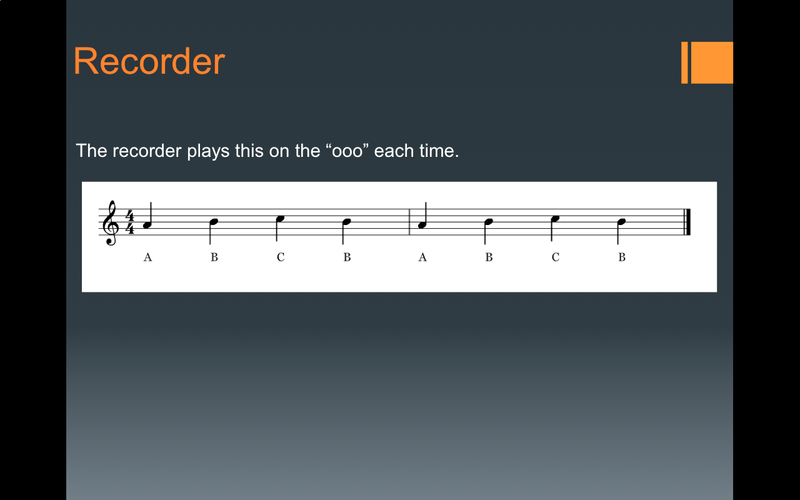 We started with the ostinato because it is one of the main elements of any Orff piece. We have a discussion about the vocabulary at the bottom and about how we repeat the pattern 13 times before "The End" (the two quarter notes). 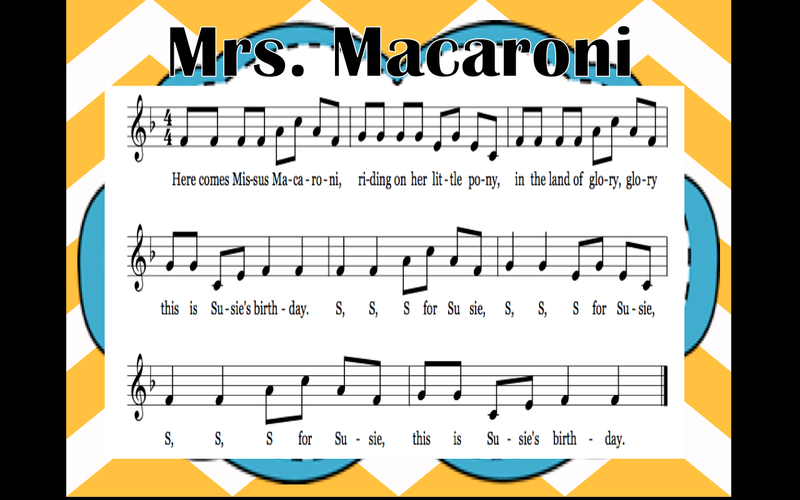 The rhythmic and melodic content (I can take the absolute pitches away after we discuss them) is totally appropriate for 4th/5th graders at the beginning of school. The students play the D and B with their left and the A and G with their right, so we can discuss sticking/cross-overs. The melody is more complicated, which we do on purpose to identify the skill-level of our students. With most Orff pieces we teach everyone everything and then if it is just a lesson piece, have the students rotate parts, or if it is a performance piece, we select which part they will play based on availability and skill. This melody if great for discussing skips and leaps, variations (the first measure of each phrases is echoed in the second but changed slightly), 16th note variations, basic treble clef pitches, and an octave gliss. By presenting the students with notation, we can enhance their learning beyond what they would learn by rote. This piece also set the foundation for ensemble playing skills (the melody must be heard over the accompaniment, the accompaniment must not rush the tempo) and improv/extensions (what if we added the basses to a D/A chord bordun on beat one of every measure? etc). This piece is one we would use to discuss form and triple meter. Notice how the phrases are color-coded - this helps A LOT. 4. We would sing (echoing me one line at a time) the phrase on pitch names at a slow tempo many times. 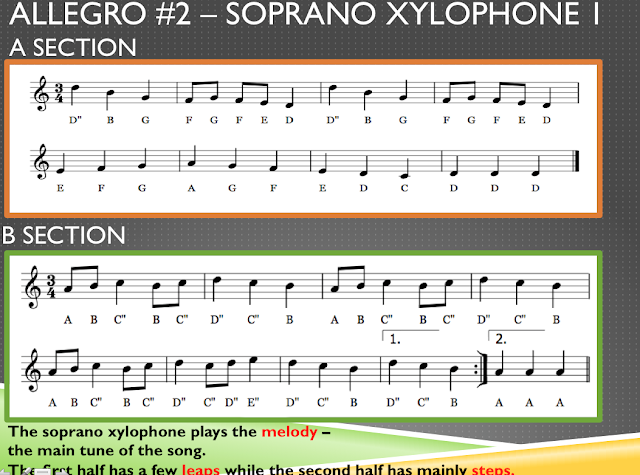 This (sneakily) gets your older students to sing and helps them be more successful on the instruments). I would play the melody for the students as they sing without me. 5. When the melody is (basically) memorized, I have a large xylophone that I project (on the screen (see below)) and slowly demonstrate how to play (students copy me with their hands in the air). Proper focus can be encouraged by having students come up and touch the screen to "play" the large xylophone (yes this works with 5th graders). 6. 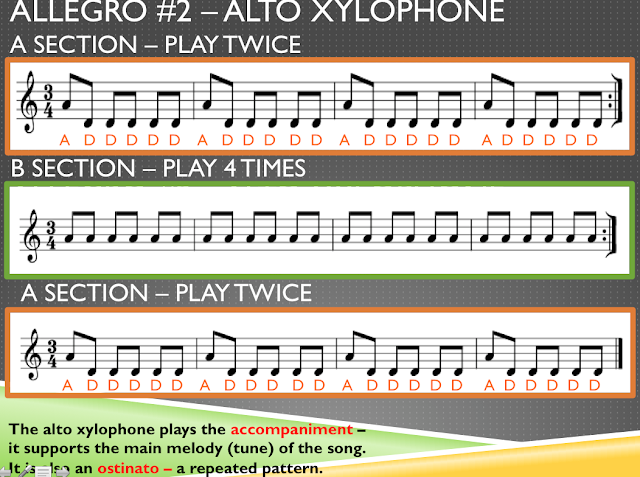 Once on instruments, we "air play" by pretending to strike the correct notes as we play. We work out the entire piece A section this way. 7. Then we play for real, line one first (I play, they echo and sing) followed by the second. We isolate and discuss any hard spots. After we have played in this manner, I give them a few minutes to rehearse it on their own. 8. We play the A section - completely, multiple times, discussing anything we need to fix or that went well. I found that this is very effective vs. phrase-by-phrase rote teaching. The students have sung the entire "melodic" picture - and they want to complete that picture. LOTS of learning takes place in the discussion and this way I can hold them accountable for things they already know (i.e. why are leaps harder to play or how is this phrase different from the next) from previous discussions. 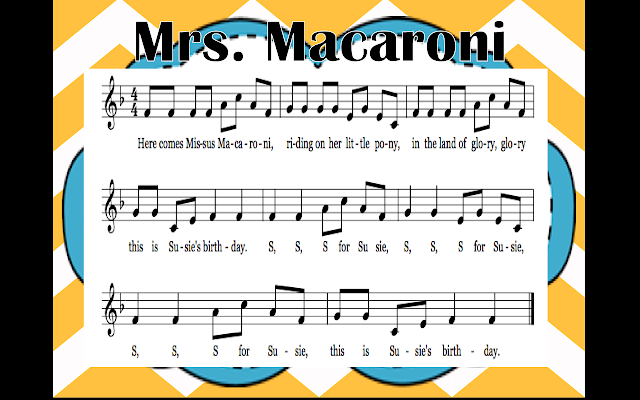 Soon, students are using terms like "phrase" or "melodic direction" and hypothesizing about where difficulties occur. They aren't just creating the music, they are analyzing and evaluating it. They are thinking critically. Here's a visual for a canon (students love playing canons) that can get your students playing a four-part piece relatively simply. All students are taught the entire piece (and since they are seeing the notation we can discuss the doted quarter note and the whole note) then gradually we build the four parts of the canon (and students can refer to the instructions on the bottom to solidify what their part does). Another tip for multi-part pieces is to give the parts their own speech-accompaniment. 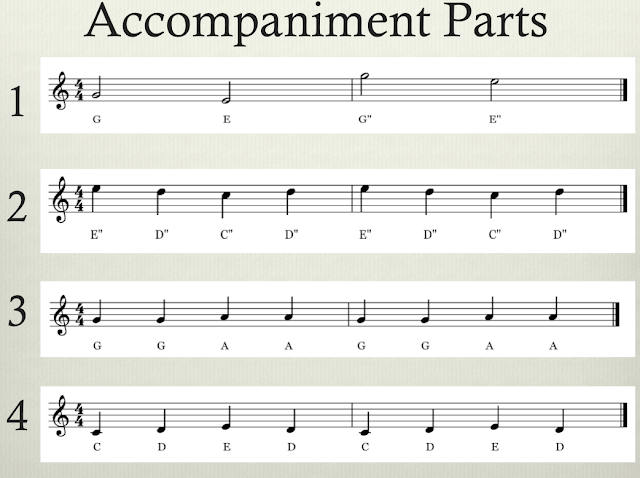 Once the notes are learned, this can help students stay together in an ensemble setting. It also gets them to sing. You can also use a slide similar to this one. I have all the students play each part. Then I divide the class in 2, then in 3, then in four. It isn't hard to ask questions like "Which part has a longer rhythm then the others and how is that difficult?" or "Which two parts have contrary motion?" etc. Visuals can also help with phrasing. I love to highlight similar phrases because students can realize "I already learned this content" or "this content just repeats" or "today we are only focusing on these two colors" and it can make a difficult melody less daunting. This is a three-mallet accompaniment for a piece our 5th graders played this year. Here is a piece my 1st graders played this year. We sang it. We discussed the rhythm only. We twirled around like leaves as we sang the tune on "ooo". We added rubbing hand drums (sounds like wind), wind chimes, a drone in the basses. But then finally, we tackled the melody. We discussed melodic direction. We sang the entire thing on the pitches. 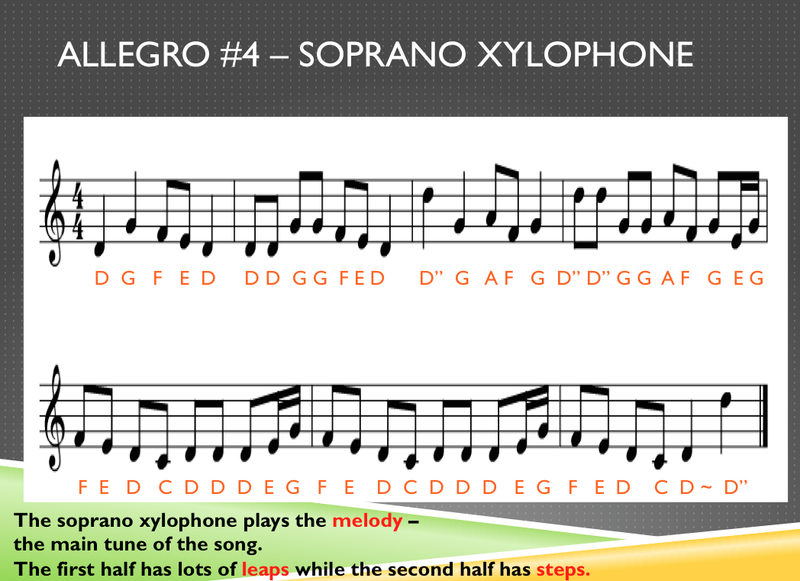 I sang the first line in two phrases and the bottom in one phrase while "playing" the big xylophone at the bottom. Students copied. Eventually, we had an entire piece with some students on the melody, some on the basses, some on the unpitched instruments, and still others with fall-colored scarves gliding like leaves around the room. We even added a form (introduction, sing, play, sing and play, coda). 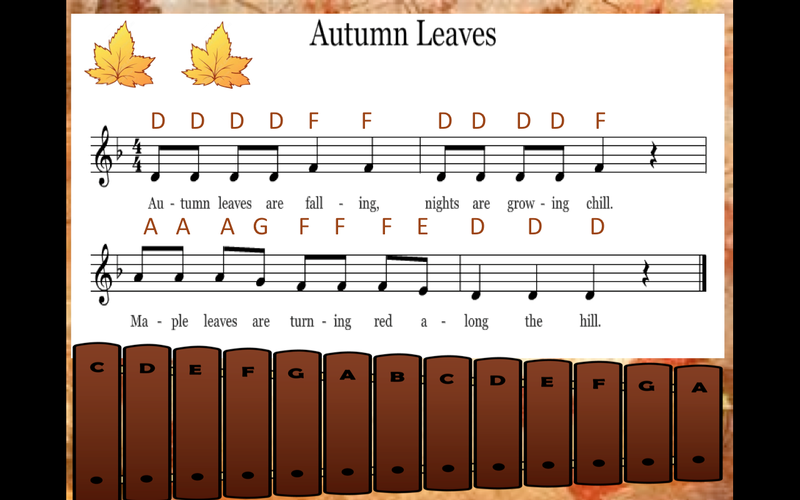 Adding visuals can really enhance your Orff-based lessons. How do you present a new piece? Hello everyone! I wanted to share this Hanukkah idea for older students - just in case you're looking to diversify your holiday season. 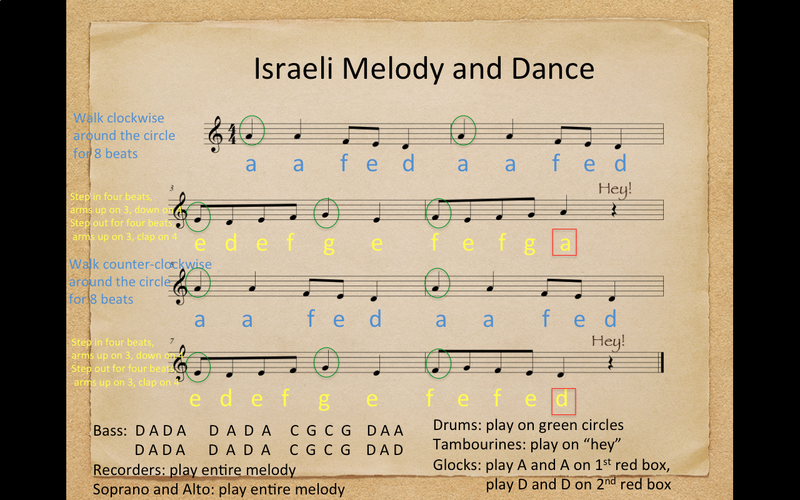 Here's a nice minor melody (I don't recall where it is from and it might not be Israeli, shh! If you happen to know, please illuminate me) that would be great for older students. Beforehand, talk about Israeli/Hebrew music and circle dancing (check youtube - lots of good video clips to show) so students have a cultural reference. 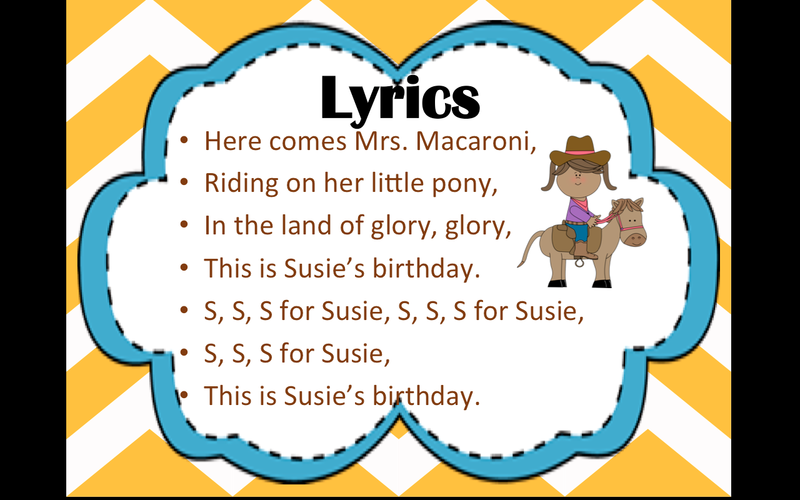 This activity is fairly simple and is a good way to cover the content/concept without taking too much class time (as I'm sure your older students are preparing for performances, sing-a-longs, etc). I like this song because it doesn't have words, that I know of at least, so the students get to experience creating and moving to instrumental music. Those on instruments realize that the dancers are relying on them to create the music. I would tackle the melody first, since the other parts are really structured around it (and you can identify which students can play it and which need a simpler part to avoid prolonged frustration). In my powerpoint, I can have the pitches labeled for those who need it, or I can simply click and the pitches are removed. 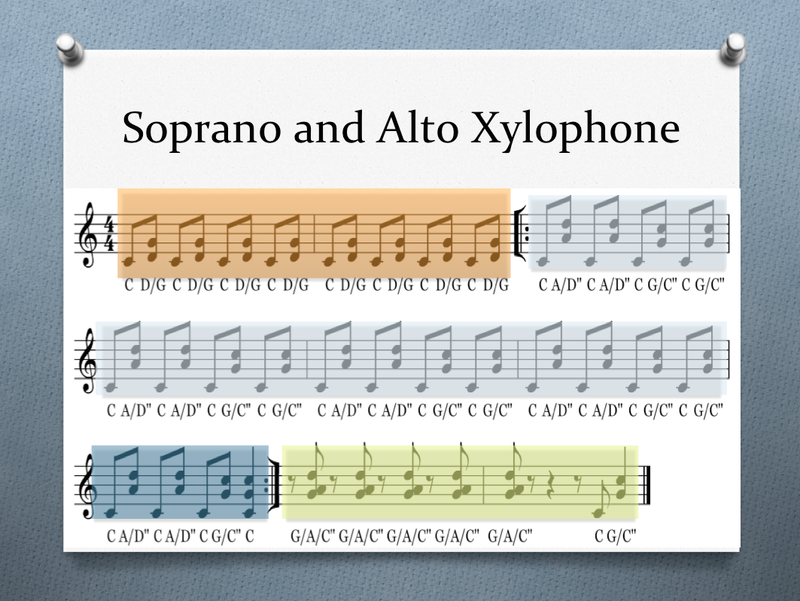 Depending on the level of your students/time restraints, you may choose to have the soprano xylophones play the blue (A) phrase while the altos play the yellow (B) phrase - that way the students are learning very small chunk of the melody. Of course, both instruments could play the complete melody, as could recorder - just add what you'd like. The drum (I like a hand drum played with a mallet), tambourine, and glock parts are fairly simple. You (or a student) could play the melody while the others pat on the circles (transfer to drum), snap on the squares (transfer to glock), and clap on the "Hey" (transfer to tambourine). The bass part is a little tricky - but students can usually figure it out if they listen and watch you play the bass part while you sing the melody. Have them identify where in the song the chord changes (moves to C and G) and also discuss the differences between the two lines (first line ends on A, second line ends on B). Be sure to tell them "if you're playing something on the "Hey" - you made a mistake" so that they don't just barrel through. You may choose to record your students playing in order to have something to practice dancing with (if you'd like to teach the movement to all the students) or you can have a few continue to play while a few learn the movements. Ideally, about half the class would be playing and half would be moving at the same time. You can see the movement suggestions (in blue and yellow) next to each phrase - simply follow those. 1. What do the blue phrases have in common? 2. How are the yellow phrases similar? How are they different? Why does the first yellow phrase end on "A" while the second ends on "D"? 3. What is the form of this melody? 4. Is this melody in a major or minor key? Which key is it? 5. How is moving to live music different then dancing to recorded music? How does this activity feel compared to you say, dancing to Taylor Swift in your living room? We all have those songs where we can't quite remember their source ("Wait, which book was this in?") and for me, this is totally one of those songs (feel free to comment if you know where it is from). 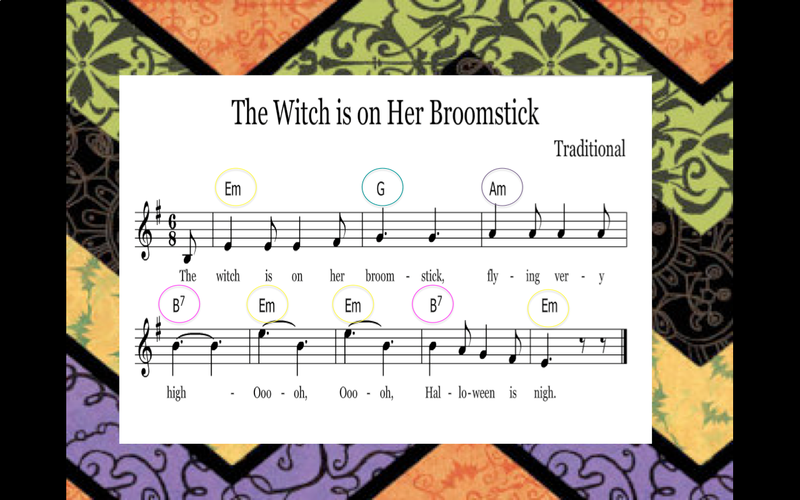 I've taught this song every year, usually with younger grades when we learn "Witch, Witch" although this year I'm going to try it with my older students as well. The range is pretty large for younger kiddos but is still accessible. I enjoy hearing pretty "ooohs" from them. We even discuss that this song is minor (when music is centered around "la" and sounds spooky, sad, or serious). 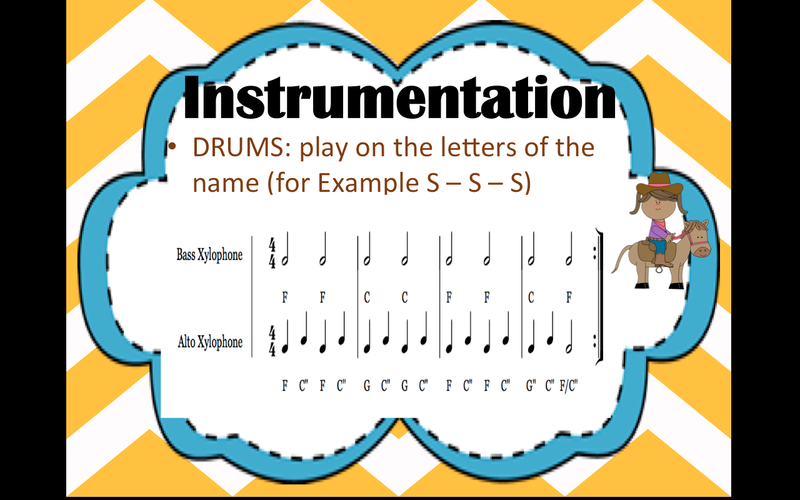 Older students can work on their 6/8 rhythms. 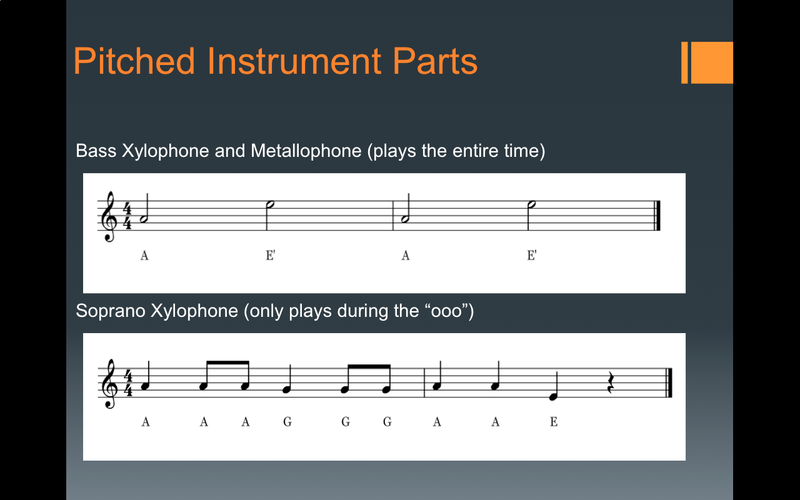 We use this slide to add instrumentation (please note that the glocks play E-B, E-B to match the pitch of the song). It is important to have a lot of kiddos on instruments so that the movement (see instructions below) doesn't get too crazy. I am currently learning the guitar - I mean, really, how have I not done this already?! I'm nothing amazing AT ALL but I can play a few chords. I am enjoying the freedom of moving the guitar wherever I need it (to our circle, on the floor, next to the rest of the instruments, etc) instead of being behind a piano. Kiddos love singing with the guitar - there is something very "campfire sing-a-long" about it. Here are the chords that I play. If you have older students or just want to challenge some of your younger kiddos - they can play the chord root only (notice the circles around them match boomwhacker colors - hint hint ;) ). 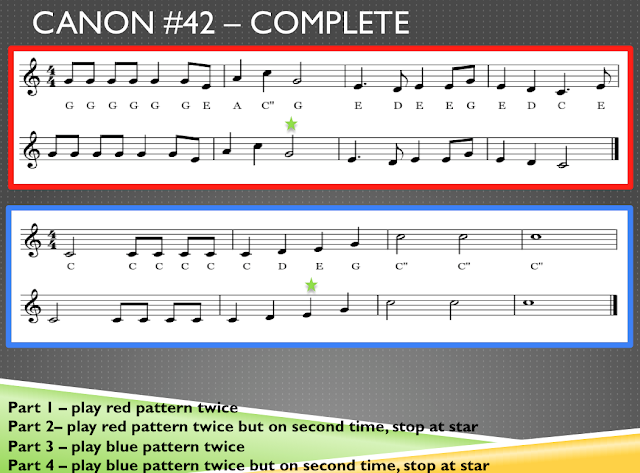 You can discuss chords and accompaniment with older kiddos at this point as well. When it comes time to switch, I just re-assign the groups to another job. Easy! Movement: The students are in scattered formation (they are the ghosts). One student is the witch (complete with a hat and mini broomstick). 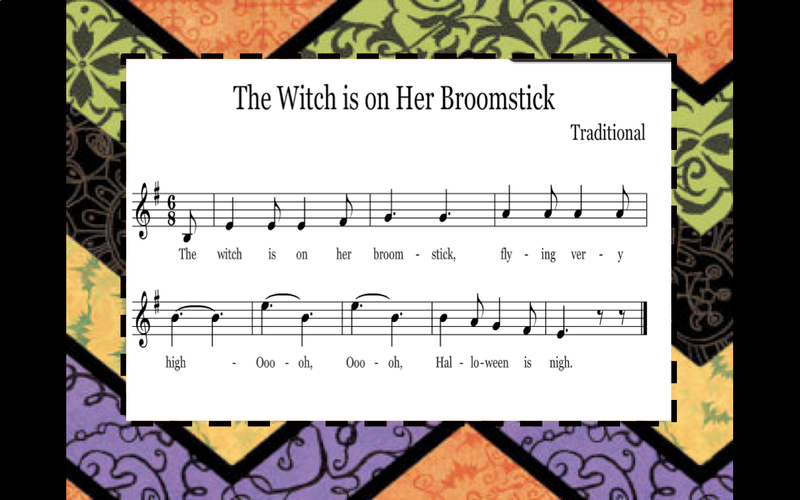 The witch flies around the ghosts for the first half of the song (the witch is on her broomstick flying very fast) the the ghosts join her in flying around on the second half of the song (ooo-oh, ooo-oh, Halloween is nigh). No, this is not really a game, however, students usually understand that drama and music go hand in hand ("How strange would a movie be without music?" or "Doesn't music make you want to get up and move?"). 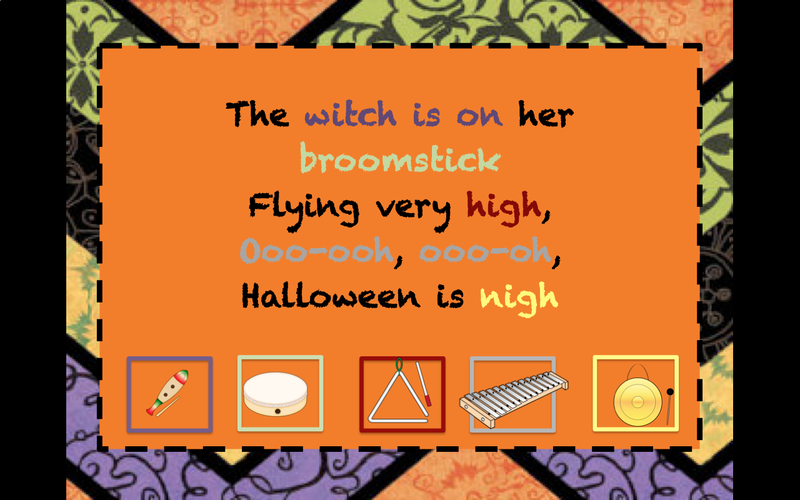 Add in a B section with the metals (Orff instruments tremolo on E, gong and triangle play freely but slowly) in which the witch chases and tries to tag the ghosts (this adds a game element - so fun). I know we all love this time of year, don't we?! I'm very excited to be working through my October lessons. I have so many fun things that I really have to pick and choose between them. Here's an activity that I'll be trying next week with my 5th graders (would be good for 4th grade too). My teaching partner is doing a really cool "Skin and Bones" lesson with our 4th graders that totally inspired this. 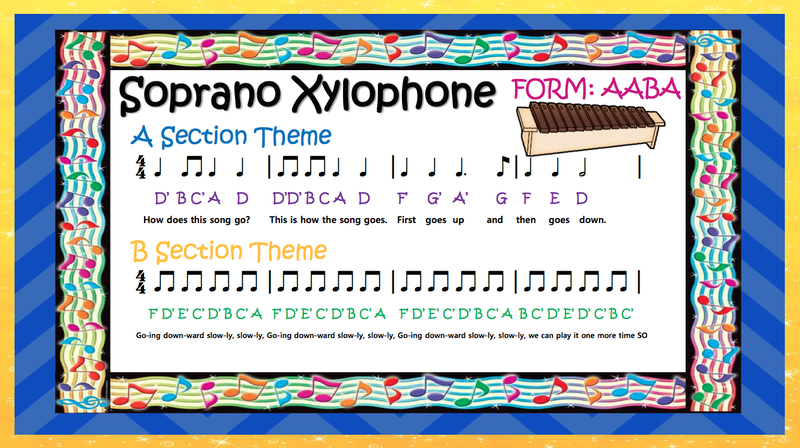 Please note: While this is a traditional song (I did change a few words), I did borrow this particular soprano xylophone part from D. Gagne's "Music Play" Grade 5 #23. She also uses the same bass part I do. First, we'll sing through the lyrics. I'll ask the students, "What do you notice about the melody?" (It remains the same throughout the entire piece). At the ghost icon, that's where the "ooo" part (same as below on the recorder) is sung. 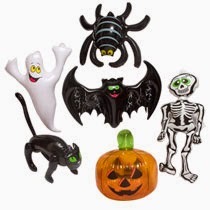 I found a cute ghost this year at Dollar Tree (see below - I'm so jealous if you find all of them - I only have the jack-o-lantern, skeleton, and ghost). I'll be giving him to one student to hold up while we sing the "ooo" (the ghost can totally trace the melodic shape of that line). Next, I'll teach the recorder part. Students can then play the "ooo" part on the recorder. Next, we'll add the unpitched instruments (see lyrics slide above). They are pretty self-explanatory. I'll also add some kiddos rubbing on hand drums to create a ghostly-wind sound (they'll play throughout the piece). I would suggest beginning with the chimes (that way you can pass that job around on repetitions) and adding in each unpitched instrument one at a time. Formation: Circle with small spaces in between students. 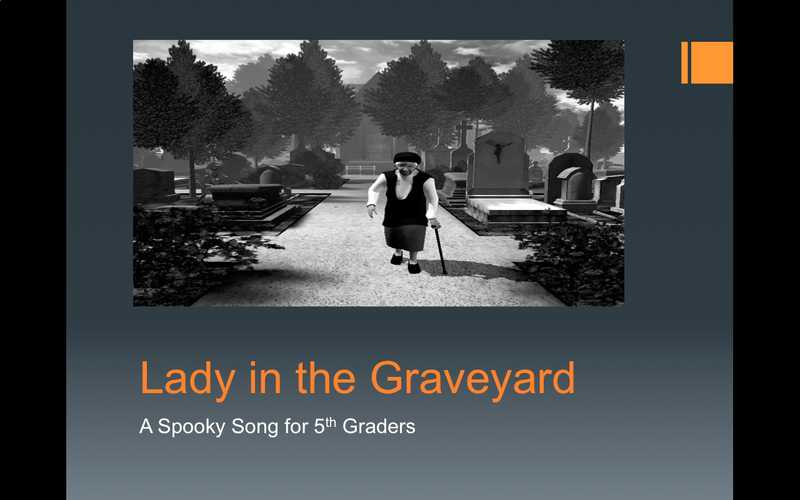 One student is the "old lady" and three other students are the "ghosts". Play: During the singing, the ghosts "float" around in the middle of the circle while the lady paces outside the circle. On verse three, only the ghosts sing, "Would you like to come inside?" and on verse four only the old lady sings, "Eww, I don't want to go with you!" Then the "old lady" shouts, "Boo!" and the "scared" ghosts fly out of the circle. The old lady chases them for eight counts (if they are caught they sit) then all the players freeze so they/the teacher can select new players. 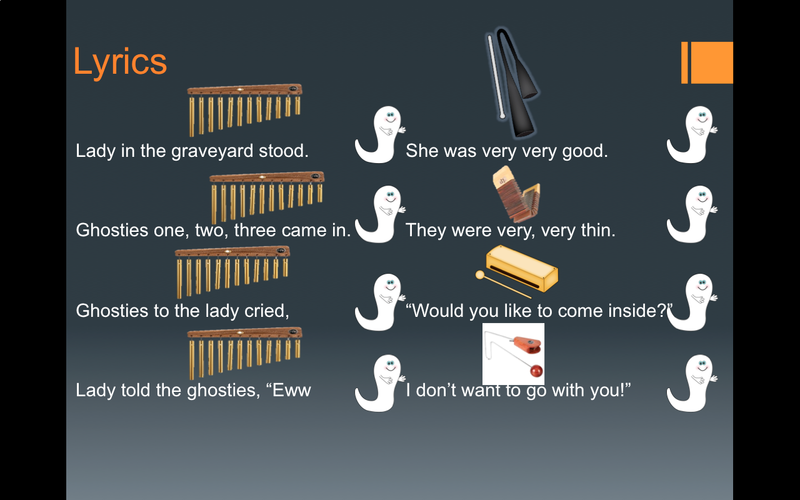 Students should be counting to eight during the playing part using a spooky ghost voice. Additions: It is totally fun for the "old lady" to be armed with a funoodle (her "walking stick") or a scarf (her "handkerchief") with which to tag the ghosts. This is a great song to discuss low la, ti, and do with older students. 1. The students should be seated in a circle. Perform the piece for the students while keeping a pat-clap pattern (pats on beat 1, claps on beat 2). Invite students to keep the beat like you are (review the term "steady beat" - at this point I would discuss that it is the steady, constant pulse of the music and show the students the corresponding vocabulary card - we also practice tapping over our hearts as we chant again). I've changed the final words to "tell us your name when you hear this sound" while we are sitting. 2. When the children are confident with the lyrics and the pat-clap pattern, walk around the circle with the steady beat in your feet. At the end of the song, stand behind a child and ring the bell tree/chimes (at this point you would discuss what the instrument is called, what type of sound it is, and what family of Orff instruments it is in). The child you are standing behind say their name and the class repeats it four times. 3. Continue this until 1/3 to 1/2 of the class has said their name. You can give your role of walking to the beat/ringing the bells to a student. 4. Bring over the bass xylophone. Label the instrument and have the students listen to the sound. 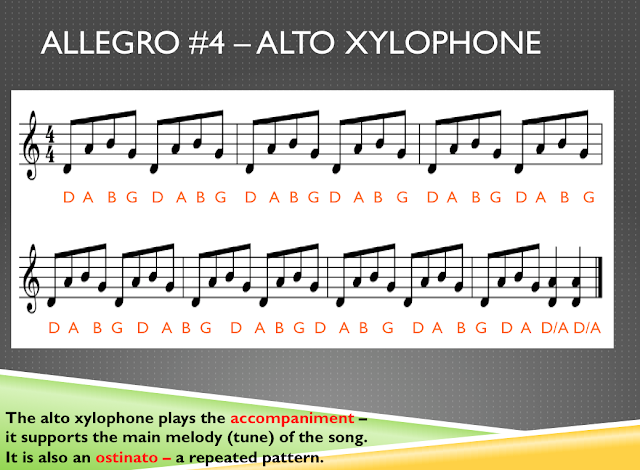 Then, establish a four beat ostinato (C-E-C-G) and chant the original lyrics (ask students to describe what words changed). Have the students stand and keep your beat in their feet in place. Once the beat is established, have the students add in the words of the original version. Tell us your name and then sit down. - Students say this in a louder voice, march in place, and then on "down" they freeze and listen closely for the name you call. If their name is called, the student sits down where they are - they become "hot lava" and cannot be stepped on by other students as the game continues. "Hot lave" doesn't have hands, so the student must keep their hands in their laps (to avoid them tripping or touching others who are still playing the game). 6. To extend this game, you could: 1) Choose a student to call names at the end of the piece 2) Allow a student who is "hot lava" to play an unpitched instrument on the steady beat a they sit 3) Allow a student to play the C-E-C-G ostinato on the bass xylophone - If you are playing this with older students, you could have them create ostinatos using student names to perform with body percussion during the song (such as E-mil-y - "ti-ti ta" - "pat-pat clap"). This year, I created my own, mostly color-coded, word wall (well, technically they are more like vocabulary cards). I'm sure I'll create more as the years go on, but if you think these could help you, feel free to download them (for free) at my TPT store. I printed them onto white cardstock, laminated them, and used mounting tape to hang them.